A mashup of the Marx Brothers and Aleksandr Solzhenitsyn, “The Death of Stalin” is a first-rate political burlesque, aswim in Soviet absurdity, about the flexible moral standards of the petrified. The year is 1953 and the place is a country that, for 20 years, has been in the grip of terror perpetrated by one of history’s more malignant dictators (played here by Adrian McLoughlin). What happens when he dies? Do his successors revert to decency and nobility? Does the nation begin to heal? That would be funny. “The Death of Stalin,” directed by Armando Iannucci (now best known for creating the HBO series “Veep”), is just funny enough. In his 2009 classic “In the Loop,” Iannucci made Machiavellian mirth out of a cooked-up invasion of a country very much like Iraq. High-stakes politics, small-minded men: It’s a sweet spot for the filmmaker, and though “Stalin” is different in many ways, both films are about craven humanity. The stuff of comedy, as Solzhenitsyn and Groucho would probably agree. High-stakes politics, small-minded men: It’s a sweet spot for filmmaker Armando Iannucci. Josef Stalin’s outrageous Cockney accent is the first clue that we’re in Iannucci territory. The second might be the baggy-pantsed Steve Buscemi playing Nikita Khrushchev. (A third is certainly Iannucci’s trademark use of hand-held camera, limited music and purposely spastic editing, which implies the same kind of documentary-adjacent immediacy that marked “In the Loop.”) We meet the vulgar, gnomish Stalin as he signs strangers’ death warrants, threatens his closest advisers and, on an apparent whim, calls Radio Moscow to get a copy of a just-completed live Mozart concert—which has, unfortunately, not been recorded. This is a problem, but not one that the station manager (Paddy Considine) can’t resolve: He simply orders the remaining audience back into its seats, drags passersby in off the street to fill the hall and has the pianist, Maria Yudina (Olga Kurylenko), play the entire concerto again. What kind of madness is this? Anyone familiar with mid-20th-century tyranny knows exactly what it is. As deliciously vulgar as Mr. McLoughlin is, he is not long for the movie and Stalin is not long for the world: The courageous Miss Yudina, whose family were among Stalin’s victims, slips an offending note into the jacket of the concert album; he reads it and suffers a cerebral hemorrhage. The scramble for power begins. The best way to nullify evil is to laugh at it. Maria Veniaminovna Yudina was a real pianist, a friend of Boris Pasternak’s and a foe of Stalin’s, but she would have been much older in 1953 than the woman played by Miss Kurylenko. The other characters are closer to the real deal. Lavrenti Beria was the head of Stalin’s security forces, a ruthless murderer and, as played by Simon Russell Beale, a corpulent nightmare. Georgy Malenkov (Jeffrey Tambor) is the heir presumptive to Stalin, but is weak, insecure and opportunistically cruel. Vyacheslav Molotov (Michael Palin) is a ditherer who, even though he knows he was marked for death by Stalin, still can’t shake off his programmed loyalty to the chief. Khrushchev is the pragmatist, which in the Stalin-era U.S.S.R. is the healthiest thing to be. Mr. Iannucci’s penchant is for the droll. The committee members, confronting the stricken Stalin’s corpse-to-be, take an inordinate amount of time summoning a doctor, expressing excessive concern that they pick the right one. (“All the competent doctors are in the gulag. Or dead.”) Their stalling is kind of hilarious; likewise their crocodile tears and declarations of fealty to the Stalinist ethos, whatever that was. No one quite wants to make the first gesture toward erasing the death lists and freeing the prisoners, not just because they are still in thrall to Stalin but because they are terrified of each other. One of the more serious observations the film makes about its characters is how long it takes each one to shake Stalin off and do something decisive. Not even the right thing, necessarily—just the un-Stalin thing. 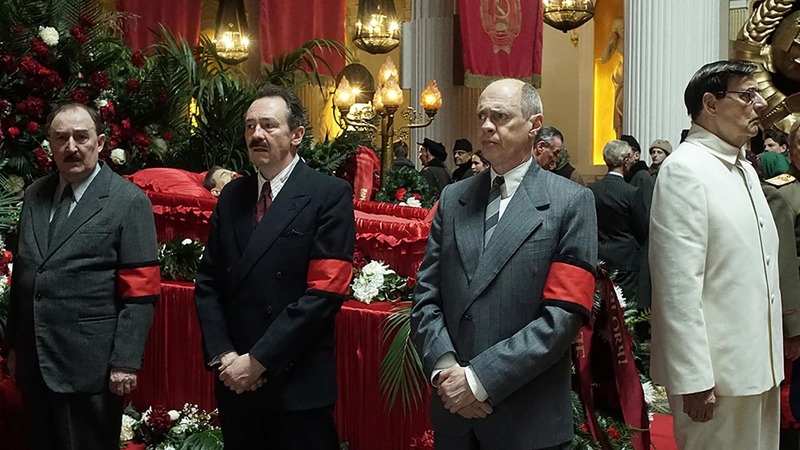 Much of the muscle in “The Death of Stalin” lies in Iannucci’s casual asides: a father staring at the son who just betrayed him to the secret police; the same father returning after Stalin’s death, to his son’s terrified surprise. “I can’t remember who’s alive and who isn’t,” Malenkov says, and it’s not really a joke. Bodies roll down stairs at Beria’s headquarters without as much as a second look. “I may as well shoot myself like Mother,” mutters Stalin’s grieving, slightly crazy daughter, Svetlana (Andrea Riseborough, who proves herself, again, to be one of the finer screen actresses alive). Her brother, Vasily (Rupert Friend), is certifiable, and is finally brought under control by Field Marshal Zhukov (Jason Isaacs), the head of the Red Army and a conspirator in an anti-Beria coup. He had some fantastic ideas. It is a shame his concept went wrong. Modern Dictators are a start.